Fighting malware today requires more than point-in-time security tools alone. It takes only one threat to evade detection and compromise your environment. Furthermore, point-in-time detection provides no insight into the scope of a breach after it has happened, leaving you blind and unsure of how to respond and contain the threat. • The ability to continuously analyze file behavior and traffic in order to uncover threats faster. These capabilities provide visibility into potential threat activity and the control to rapidly contain and remediate malware. You get integrated protection before, during and after an attack across the extended network. that malware gets in, the ability to quickly detect, contain, and remediate it. 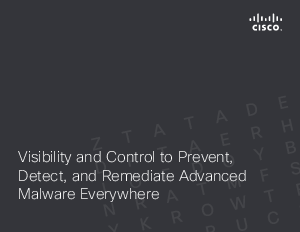 Cisco Advanced Malware Protection provides this, allowing you to protect your organization before, during, and after an attack.